Renzo Bossi wearing a t-shirt that says "We'll never be Rome's slaves!" 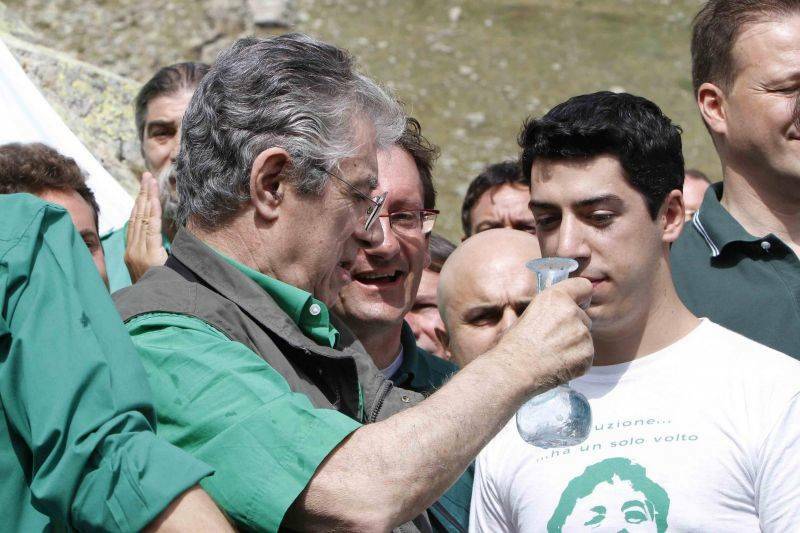 Umberto Bossi, founding father of the Northern League, resigned as head of his party last week. After 30 years of blaming Rome of robbing, it turns out that some in Bossi's entourage were themselves stealing from the till, and on the grand scale. 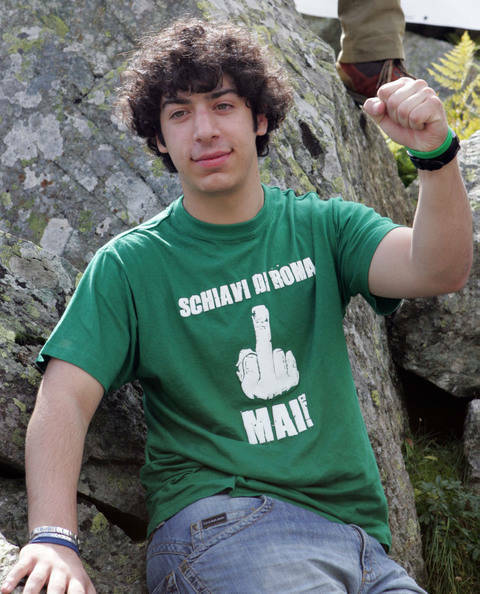 Bossi's son Renzo, who purchased a university degree with public funds, was no exception. 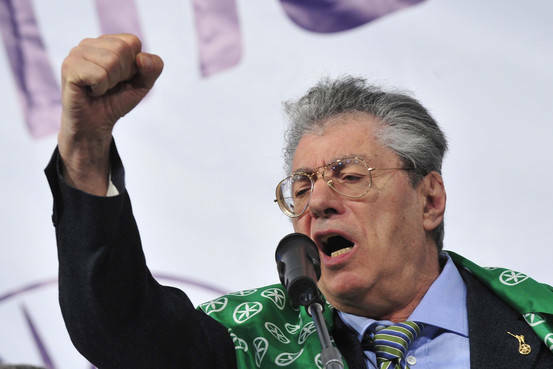 ROME – Umberto Bossi, 71, founding father of the 30-year-old Northern League, liked to hurl invectives at the Italian nation, as opposed to his beloved, honest and above all northern Padania. A favorite insult was “Roma ladrona!” (Rome the Robber), referring to the national government. But now the chickens have come home to roost—and I use the word “chickens” advisedly—for it turns out that some in Bossi’s entourage, known to League insiders as the “Magic Circle,” were themselves stealing from the till, and on the grand scale. 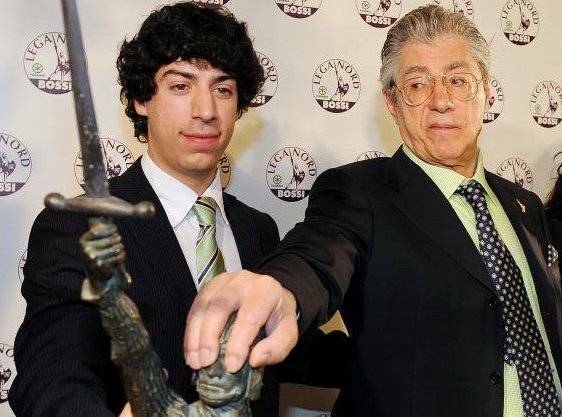 Despite his debilitating stroke, until now Umberto Bossi, a former cabinet minister, had continued to play the jokester, shouting filthy words at journalists and giving them the finger, repeatedly, while ignoring questions from the press. The fun ended this week when Umberto broke down and wept on a national TV political talk show, saying that his family’s misdeeds were his fault, and that he was resigning as head of his party, which immediately, however, kicked him upstairs as its honorary president. According to leaked testimony from witnesses for the prosecution who include League party officials, Bossi’s son actually purchased a university degree from London, paid by publicly provided party funds. A second son received money for vaguely defined consultancies. Other party funding was allegedly diverted to investments in Tanzania and Argentina, apparently out of fear that the Euro would collapse. The vice president of the Italian Senate, Rosy Mauro, is one of the closest inside the Magic Circle. When Bossi had his stroke in 2004, the stocky, black-haired Rosy moved in as his self-appointed caretaker, prompting another Bossi-crowd nickname, “la Badante.” Married, la Badante is also best friends with a male singer who likes to imitate Elvis Presley in night clubs, and who during her tenure there obtained a well-paying job in the Senate. Rosy’s management of Senate meetings, when she has been handed the gavel, is casual. Take a look at the Rosy show on YouTube called “La Presidentessa Impazzita” (The Crazy President), in which she ignores the voting senators entirely, deciding on her own that the assembly had approved a bill she favored). The most important issue at stake is public funding of the Italian political parties. Bossi’s party treasurer, who is accused of investing party money outside of Italy, resigned last week, and allegedly had links with the Mafia in Calabria (!) And Bossi’s party is not the only one at risk of judicial action for misuse of funds. The former treasurer of the Margherita party, Luigi Lusi, is under investigation for party funds he sent to a personal account in Canada. And some already defunct parties were receiving funds as well. Back in April 1993, a referendum on public financing of political parties was held. Nine out of ten voters voted against it, and public financing officially came to an end. Nevertheless, within months a law was slipped in through the back door permitting “reimbursement” of party expenses. According to Italian press calculations, in 2002 the government headed by Silvio Berlusconi then doubled the reimbursement for all elections (local, national, and to the European Parliament). Reimbursements have risen further since then, with accounting justifying only about one-third of the public funding provided. The result: Italian public financing of political parties is double that of France and Germany. According to the Court of Accounts, Berlusconi’s Forza Italia, even after it ceased to exist, received € 128 million as reimbursement while its officially justified expenditures amounted to only € 50. Where did the rest go? Some parties have already opted for independent accounting firms to go over their books so as to insure propriety. These include the Partito Democratico of Luigi Bersani. Since November this has been an interregnum between the full-fledged governments which, unlike the present technocrat government headed by Mario Monti, represent specific political interests. But this May brings local administrative elections, and so the political fall-out from the unrelenting spate of scandals unveiled since Monti took office is likely to be reflected in the vote, most likely by a low turn-out from a disaffected electorate.